My vision changes every hour, sometimes I can read a street sign, recognize a friend, or read a newspaper headline. Some days I can’t see an inch past my nose. It’s taken 27 years for me to accept my visual impairment. I was born with nystagmus, limited depth perception, and almost no peripheral vision. Alongside light sensitivity and myopia, it’s a mixed bag of sight issues that my doctors continue to puzzle out. My vision changes every hour, sometimes I can read a street sign, recognize a friend or read a newspaper headline. Some days I can’t see an inch past my nose. In a typically British approach, my parents didn’t want to make a fuss about my disability. They encouraged me to be as normal as possible and it was the best solution when no other help was offered. To this day, my mum says how much she wishes the internet had been around when I was growing up. 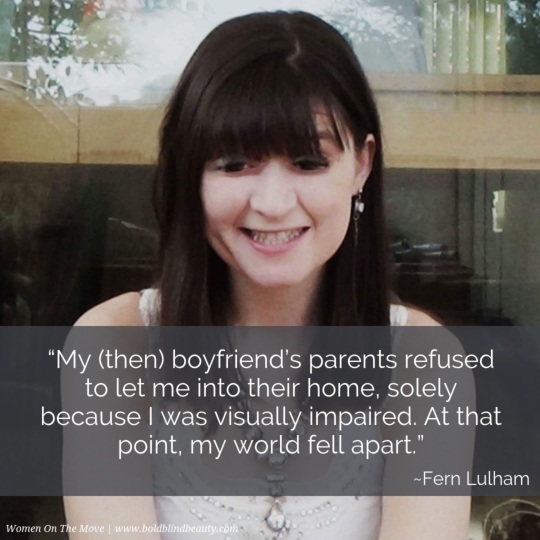 Although I knew I was different, I didn’t really feel the impact of my visual impairment until I went to university. I’ve always loved history and I pursued my passion all the way to a PhD! I spent nearly a decade in higher education, and over the years had some of the happiest and lowest times in my life. Working towards my PhD was exhausting and being in denial about my visual impairment added to the strain. Eventually, the work took its toll on my mental and physical health. I’m immensely proud of my accomplishment, as acquiring my PhD was a huge achievement. However, in the end, I knew I needed a change. It was only through starting a new career at a disability charity that I realised how much help I denied myself. So I started to reach out for some support. First I turned to my twitter community, I had used the social media platform for a few years, mostly for academic networking, but I soon discovered an entire online family of visually impaired people. These new friends had so much advice and guidance. They had been there; they had struggled, they had denied the difficulties, and also finally they had asked for help. It was so refreshing and such a revelation to hear so many similar stories and read about so many people living confident lives after sight loss. I was encouraged to contact Guide Dogs UK, but I was skeptical. Part of my problem was that I just didn’t identify as “blind.” Even though I was born with a visual impairment, I didn’t think of myself as disabled. Everyone always went on about sight loss, but I’d never had it in the first place! It was my normal, but I was fast realizing I didn’t just have to put on my stiff upper lip and accept it. Contacting Guide Dogs UK changed my life. The support, skills, and encouragement they have given me, has been incredible. Just one year later I’ve gone from suffering in silence to being a visually impaired activist! I’m now a confident long cane user and I’m waiting for a guide dog. Instead of being in denial about my disability I now advocate for the rights and equal opportunities for visually impaired people. I’ve even started a campaign to encourage the public to offer help to disabled people. My #JustAskDontGrab message uses my experiences of positive help, and unwanted grabbing, pushing or pulling, to educate people about how to offer assistance politely and respectfully. Over the last few months it’s gone viral, and I’ve been on the radio, tv and in newspapers! It’s been a whirlwind, but such an empowering experience. Also, I’ve been overwhelmed by the number of visually impaired people who’ve contacted me to say they’ve experienced the same journey. They’ve told me, my story of accepting my visual impairment and the cane has encouraged them to do the same. I will keep sharing my story because it’s the message I needed growing up. I want young people struggling with their disability to know that they don’t just have to cope. They don’t have to manage alone, there is help out there, and that asking for support is the first step to being themselves, rather than hiding who they really are. Since embracing my visual impairment as part of my identity I’ve been a happier and more confident person. Using a long white cane has given me freedom and I can travel independently and safely. Most of all, I finally feel like the real me. Of course, there are still difficult days, but I’ve stopped denying my real self and now I openly love my disability. Profile photo of Amy walking through a park. She is using her long cane and wearing a summer dress. Head and shoulder shot. Amy is sat in front of a wall with the BBC logo on. She is wearing big headphones over her bright pink hair. She is smiling and looking at the camera. Amy is standing at a London underground station, with the classic red, blue and white sign behind her. It’s a sunny day, Amy is wearing sunglasses and holding her long cane across her body. She has a light turquoise 50s style print dress on. A selfie, it’s a sunny day, trees and blue sky in the background. Amy is smiling looking at the camera in large round sunglasses. Her hair is blond with bright pink hair fading from the top. She is wearing a black t-shirt and badge, the badge shows a pair of sunglasses and reads, medical necessity not fashion accessory. Today’s Woman On The Move, Jennifer Dunlap shares her heartbreaks and triumphs while living with RP. FYI – Jennifer was also a recently featured Blind Beauty. I wasn’t surprised by my diagnosis of Retinitis Pigmentosa (RP). What surprised me was how the disease took hold of my youth and unraveled it unexpectedly. It’s fairly common for women in my family to have RP. My mother, her mother, one of my aunts as well as her daughter―all have this eye disease. There are a few members of our extended family with RP as well. 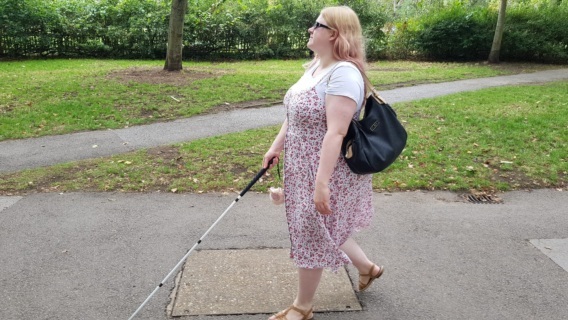 We all have varying degrees and different sight loss stories. With the exception of me and my mother, the other female family members were able to drive among other things. They were able to drive and only had vision loss in dim lighting or issues with peripheral vision. With RP, gradual vision loss and eventual blindness are expected. Not knowing when or having the exact timeline didn’t scare me as a kid. The majority of my family with this disease didn’t start losing a lot of vision until their late 30’s. My only setbacks as a child were not being able to play cops and robbers in the dark and decreased peripheral sight. When high school hit, everything changed and my vision began decreasing rapidly. It took a toll on my self-esteem because I felt like I couldn’t actually see what I looked like. I struggled with body issues and developed bulimia, yet I was able to hide my self-loathing very well. 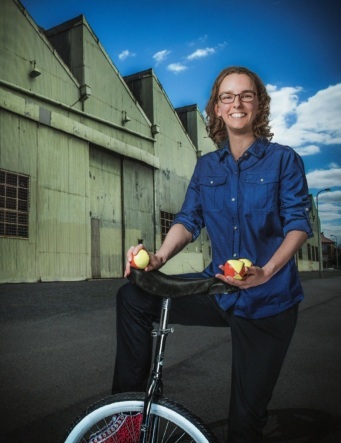 Once my vision became an unavoidable obstacle, I got a mobility specialist. Then I looked at my options with a counselor who could help me find my footing in the blind world. In a matter of two weeks, I found out I wouldn’t be able to drive and was declared legally blind. I wasn’t heartbroken, I was angry and still struggling with my appearance. My senior year of high school was when I was fitted with my white cane and low vision aids. I pretended to be strong on the outside to get through my senior year. But in reality, I was up and down with depression and an eating disorder. I hid things so well from my family and was already accepted to a great college one town over. They didn’t notice the internal struggles, and I wanted to keep it that way. Even though I did really well in college, I still had issues I was hiding from everyone. My vision kept getting worse, but I graduated with a Bachelor’s degree in English with a concentration in writing. I also had two minors- Professional Technical Writing and Women’s and Gender Studies. Getting my degree helped me find a new understanding of my eyes and what I could accomplish, but I couldn’t shake the self-loathing. My purging and depression became so bad, that I was hospitalized for a suicide attempt. Seeing my body crash from the damage I caused, made me realize that my blindness wasn’t at fault for my bulimia. After a lengthy period of rehabilitation and out-patient counseling, I was able to find some hope. I married my best friend from high school and only had a few issues with relapse. 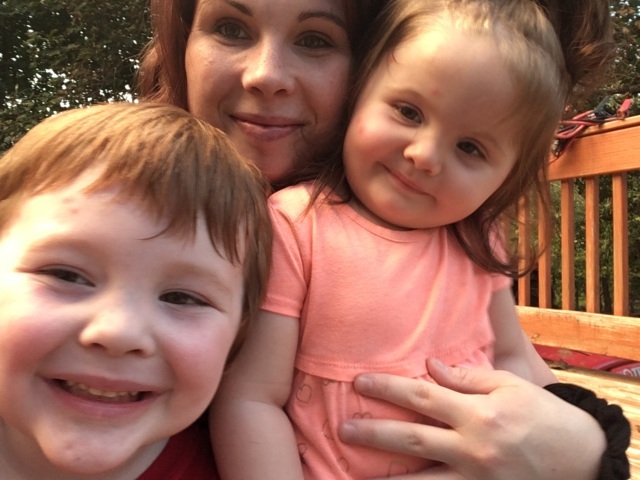 Once we decided to start a family, I didn’t let my vision loss hold me back, and I decided to be healthy. It was a decision only I could make. Having kids was the self-loathing turning point in my life. I realized that seeing beauty isn’t as powerful as feeling it. Being a mother made me love myself. I couldn’t see the detail in my babies faces. My vision was like seeing through a straw and there with broken glass at the end of the tunnel. The colors were dim and lighting played a big part in what silhouettes I could see. I didn’t let the vision loss hold back my opinions about how beautiful my children are or how beautiful my life had become. Motherhood showed me that blindness wasn’t my weakness, it was my superpower. Blindness made my other senses stronger, and it helped me find the self-love that I needed. I was wrong to blame RP on my self-doubt. RP became the backbone for my character and confidence. In the photo, Jennifer is holding her adorable son and daughter. All three are smiling for the camera. This photo is a selfie of Jenn. The softly smiling, long-haired brunette beauty is wearing a yellow tee under a plaid shirt.